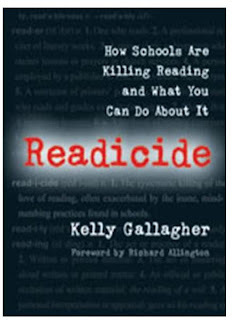 With all of my flying time I recently had the chance to read Readicide: How Schools Are Killing Reading and What You Can Do About It by Kelly Gallagher. Readicide had been recommended to me in a recent coaches’ workshop but my interest in reading it was enhanced as I just finished working with a high school that has 60plus percent of their students needing intensive reading courses. Gallagher, a high school English teacher in Anaheim, CA and author of several books on teaching reading and writing, argues that our instructional practices in all content areas as well as in reading and English classrooms are killing reading. In an earlier blog, I noted parents’ use of vocabulary with preschoolers and its impact on learning. Gallagher states, ”If those students who enter schools linguistically impoverished — thirty –two million words behind—do not read extensively, they will never catch up. This bears repeating: struggling readers who do not read voraciously will never catch up.” This creates a challenge for teachers who need to convince the students who least want to read … to read a lot. Gallagher’s own survey identified that seniors reported reading on average 13 minutes a day at school (outside of his English class). Generally students who needed reading practice most, read less. Does it makes sense that many schools have dropped sustained silent reading when data suggest that on average Americans fifteen to twenty-four spend only seven minutes of their leisure time on reading? Gallagher shares a classroom occurrence of his that illustrates the problem of students lacking sufficient authentic reading experiences. Students reading an article stopped him and asked for help with understanding the phrase, “ the lifeblood of al Qaeda”. His first probing question to the students elicited the concern, ”We don’t even know who this Al guy is.” Gallagher provides other examples from his students and concerns from other teachers that illustrate high school seniors, soon eligible to vote, lack sufficient background knowledge to be full participating citizens. Gallagher institutes an “Article of the Week” assignment sending students to real world news stories, essays, editorials, blogs, and speeches. (See a listing with links to recent articles he uses) A classroom set of Newsweek provides Gallagher’s students with a real world text reading assignment one night a week. I have personally seen less authentic reading tasks in classrooms as teachers increase test prep activities. Readicide concludes with a list of concrete steps teachers can take to develop recreational and academic readers. Both are critical. Gallagher recommends bringing the books to the students. He has 2000 books in his room and list 100 books his students love in his appendix. Larry Ferlazzo’s blog shares how he has students review 100 books on the opening day of school to identify interest and select a first read for the year. A teacher like Gallagher or Ferlazzo would have been a great addition to my high school reading practices! Glad you found my post useful! Readicide is one of the most powerful books I have read in a long time. It did, however, lead me to develop a program in my school that encourages our middle school students (and teachers) to read more and talk about what they are reading. I utilize concepts in two other books to support the fight against readicide… The Reading Zone (Atwell) and The Book Whisperer (Miller). The changes we are seeing are profound! I love The Book Whisperer! Larry… I enjoyed your blog and really needed a teacher like you when I was in school… I had to many not reading years..
Kathi– I’d love to hear more about your program that’s increased reading. Do you have anything posted? First off I want to say that I really enjoyed your presentation at the US Dept. of Ed’s Reading Institute in July. In this post, you asked, “Does it makes sense that many schools have dropped sustained silent reading when data suggest that on average Americans fifteen to twenty-four spend only seven minutes of their leisure time on reading?” My answer to that is yes and no. The National Reading Panel (NRP) said they could not find enough studies to prove that independent reading in the classroom was beneficial. (They did not say it was harmful.) Many educators decided to eliminate it anyway. This decision bothered many, but I think the way silent reading has been typically implemented in classrooms is part of the reason why there isn’t any evidence proving it’s beneficial. Note: I normally do not include so many links back to my blog when I leave comments, but you asked Kathi if she had posted anything, so I went ahead and posted mine. I hope you don’t mind. Thanks for all the connected links I will encourage others to explore… Start of the year is a great time to examine our Reading practices. We have recently discovered Readicide, too! What a great find! If you’re interested in reviving SSR but with better accountability, try Kelley & Clausen-Grace’s R5 in Your Classroom. It appears to be written for elementary use, but we have found secondary reading specialists who have made it work very well!